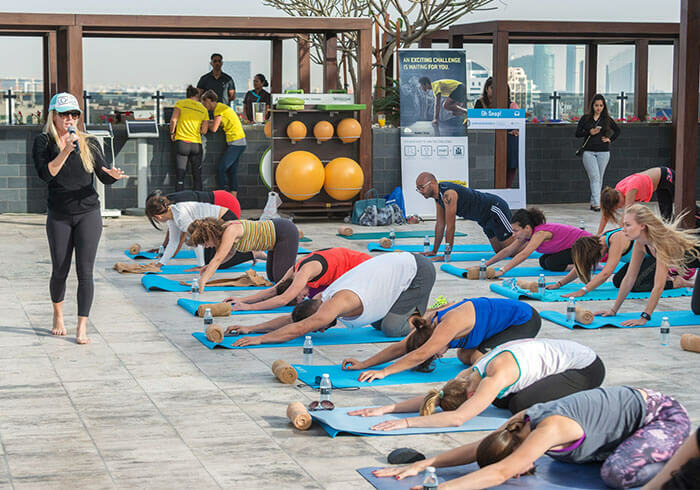 Pullman Dubai Creek City Centre and Pullman Dubai Jumeirah Lakes Towers, in collaboration with Dubai Active Show, welcome the Global Pullman Wellness Coach, Sarah Hoey, for a series of Yoga & Fitness sessions which will take place in both hotels in March. Members of the public are invited to sample the hotel’s new wellness offering, which includes an agenda aimed to enhance the hotels commitment to wellbeing through a brand-new holistic approach, aimed to create a healthier generation of travelers. The FREE to attend agenda includes a series of paddle board yoga sessions, pool sunset hatha yoga, TRX workouts as well as active breakfast and nutritious workshops, all delivered by Global Pullman Wellness Coach, Sarah Hoey. All attendees will have the opportunity speak with Sarah one-on-one, who is a personal coach, fitness model and certified nutritionist. She has professional wins and coaching achievements throughout the world and is passionate about sharing her skills and knowledge. Her holistic take on fitness and love for teaching make her the perfect candidate to become the Pullman Wellbeing Coach. She has been traveling through all the Pullman located in all 5 continents sharing her coaching techniques, enabling everyone to live a stay which balances performance with enjoyment. Sarah throughout her career has trained and taught some of the fittest groups of people perhaps in the world such as the US Navy and the NFL Cheerleading Squad. Kindly RSVP your free seat at h2022-mk1@accor.com at Pullman Dubai Creek City Centre or aline.ibrahim@accor.com for Pullman Jumeirah Lakes Towers, for the timings you wish. Each participant can choose as many as sessions as he/she wishes.